In a large bowl add all the dry ingredients. Take another bowl start adding egg whisk it well.Add butter in whisked egg. Add milk in egg and gently whisk all the wet ingredients. We will not mix blue berries in this batter.. Grease the pan with some butter. Pour your batter on heated pan and sprinkle blueberries on the top of pancakes wait till bubbles appear on the sides of pan cake. Then flip them upside down and wait till they get brown on other side. 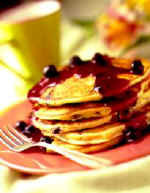 You can enjoy ur pancake with jam, butter or honey.